So, I get off of work at 11:00 meet up with Tim Taylor, Kevin Dowling, and Adam Mcmanus at our house. For anybody unaware, Adam's car is always nasty, so before we head out, I do some militant style cleaning inside his ride to make room for our luggage. At about 1 in the morning, we get on the road and head to Boone. The ride up was filled with good conversation, funny jokes and a few random bathroom breaks. I think we actually got into Boone at about 3am and didn't manage to get to sleep until about 5am. Nonetheless, we get our 5 hours of sleep in and get ready for the next day. Kevin and Adam had slept at Andy Kruse's house the night before so at about 10 we called them and had them meet us at the park. When we get to the park, there were an unusual number of rollerbladers there, which considering the cause, was very exciting. So a job well done by the Glenny's and Thomas Martin for organizing the event. This wound up being the last spot, now it was time for friends and beer. Upon arriving to Thomas' apartment, we were greeted by Kevin and Andy, who had been drinking since the comp was over, and they provided great entertainment. Some memorable moments, when Kevin stole a random laptop and held it on his shoulder calling it the "boombox", Kevin proclaiming his love for Dustin Hinson, and Kevin asking Adam what our generation has contributed to the world and Adam responding..."myspace." So really, dirty took the show that night. The next morning we woke up, had some bojangles, and headed to this weird mountain rail spot where we all did a little skating. 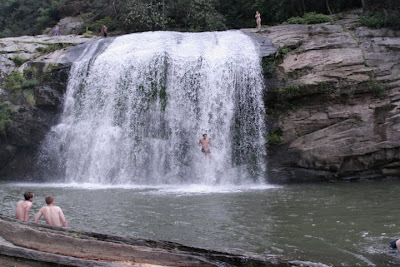 After an hour or two there, Andy suggested that we all go swimming at these waterfalls here in Boone. So, we make our way back to Thomas' house and then leave to find these waterfalls. On the way there I have to admit, I was a bit annoyed because it was taking a while to get there and I was on a bit of time schedule, but once we got there and parked and I could hear the waterfalls, I swear, nothing mattered anymore and that feeling was reaffirmed by the actual site of the waterfall. After hanging out for a bit and jumping off of these rocks, we got our things together, hiked back to the car and headed home. On our way back we stopped at this spot to get a couple of clips and got a few really good ones of Andy doing some awesome Mushroom blading into this bank. Due to some personal problems, I had to trek back home a little earlier, and in a less excited mood than I wanted (my bad guys) but got home in an orderly fashion, got business taken care of and rested up for the week to come. I'll be moving apartments soon here so the posts may be a little scattered, but I'll be filming so, if nothing, expect a big post in the future! Peace. *I'm all moved in, and back on track.